All spiders have hollow fangs to inject venom into their victims—usually other insects—but in most species, the fangs are too short or too fragile to break human skin. The brown recluse spider and the black widow spider are among the very few species that can bite humans and inject dangerous venom. The brown recluse spider has three pairs of eyes and an upside down violin-shaped marking down its back. They live only in the Midwest. Black widow spiders are shiny with a distinctive red hourglass shape on the under-side of their abdomens. Black widows live in warm climates. You might not realize that you have been bitten until symptoms develop. The bites from a brown recluse and a black widow look similar, like a target or bull's eye, centered at the site where the fangs penetrated. The California Poison Control System says that in the case of a black widow bite, a red ring surrounds a pale center while in the case of a brown recluse bite, the center forms a blister, surrounded by a red ring and then a pale ring. Within about 10 minutes, pain, burning and itching develop at the site of a brown recluse bite. Within 24 to 48 hours, an itchy red rash appears over the whole body. Depending on the amount of venom injected, you might also suffer from fever and chills, nausea and vomiting, muscle aches and destruction of red blood cells (hemolytic anemia). The blister in the center of the bite can break and form an ulcer (necrotize). A deep ulcer can involve muscles, causing serious pain. According to the California Poison Control System, the greatest risk from a brown recluse bite comes from an infected ulcer. 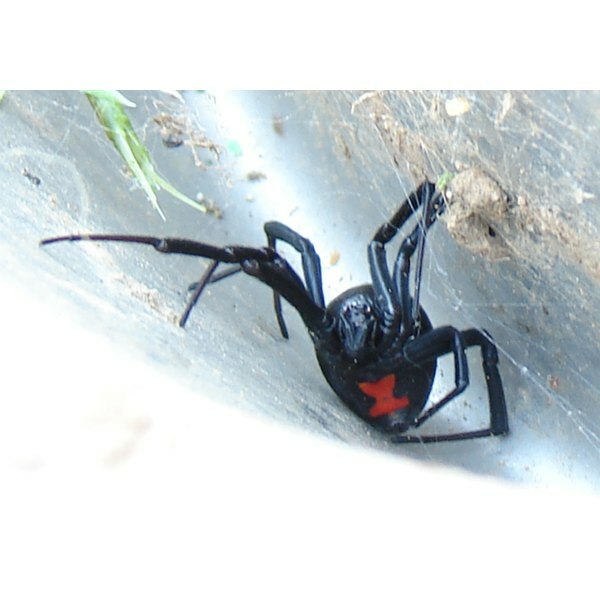 Black widows do not always inject venom when they bite, says the California Poison Control System. Symptoms of a venomous bite develop within about two hours and include severe muscle cramps in the back, shoulders, abdomen and thighs; weakness, nausea, sweating, headache, difficulty breathing and high blood pressure. These symptoms result from the venom itself. Usually, venomous spider bites do not require treatment beyond washing the area and applying antibiotic ointment. You can elevate and immobilize the site of the bite to minimize the spread of venom. According to Dr. Swanson in the February 2005 issue of the New England Journal of Medicine, no one treatment for brown recluse bites has been proven effective, and most bites heal on their own. If the ulcer from a brown recluse bite becomes deep or infected, you might need to take antibiotics. Occasionally, people with very deep ulcers require surgery. If you develop cramps after a black widow bite, you should go to the hospital. Black widow anti-venin can treat the symptoms, but it is rarely needed because other medications can treat the symptoms, says the California Poison Control System. People have an inflated sense of dread regarding venomous spider bites. According to the California Poison Control System, no one has died from a black widow bite in the United States in over 10 years. According to Dr. Swanson, necrosis rarely follows a brown recluse bite, and even serious cases are rarely life-threatening.